Thángthas ar an gceann máis deasghnathach seo i seomra an tuama thoir faoi bhun an tuama mhóir pasáiste i gCnóbha, Co. na Mí, i nGleann na Bóinne, agus tá sé i measc na saothair ealaíne is breátha de chuid na hEorpa Neoilití atá ar marthain fós. Ghlac an t-ealaíontóir gan ainm píosa breochloiche bánléithe an-chrua, a raibh spotaí donna air, agus shnoigh sé cruthanna diamaint agus bíseanna guairneánacha ar gach ceann dá shé dhromchla. Ar an éadan, is cosúil gur aghaidh duine atá ann agus poll an chrainn mar a bheadh béal oscailte ann. Níltear cinnte i dtaobh cad as an chloch (as Inse Orc, b’fhéidir) ach más rud é gur snoíodh an ceann máis in Éirinn, tugann an réad le fios go raibh céim an-ard sofaisticiúlachta ealaíne bainte amach ag duine éigin ar an oileán. Tá sé molta ag an seandálaí, Joseph Fenwick, as Ollscoil na hÉireann, Gaillimh, nach bhféadfaí cruinneas na snoíodóireachta a bhaint amach ach amháin le druilire rothlach, is é sin le rá, ‘meaisín a bheadh an-chosúil leis an uirlis a úsáidtear chun maisiúchán dromchla a chur ar réada ardghradaim an lae inniu amhail Criostal Phort Láirge’. Insíonn an bhaint atá ag an saothar urghnách seo le ceann de na mórthuamaí pasáiste rud éigin dúinn faoin tsochaí a thóg na séadchomharthaí sin nach stadann riamh d’iontas a chur ar dhaoine. Bhí an tsochaí sin sách saibhir chun meas mór a bheith acu ar scileanna speisialtóireachta agus ar nuálaíocht ealaíne agus bhí sí ag éirí níos tugtha don ordlathas rud a d’fhág go raibh uasalaicme ann a bhí in ann smacht a bheith acu ar acmhainní móra daonna agus fisiciúla. Ba ráitis iad Cnóbha agus na mórthuamaí eile. Mar atá ráite ag an seandálaí, Alison Sheridan, as Músaeim Náisiúnta Alban, ‘go bunúsach, bhí siad ceaptha mar na séadchomharthaí ba mhó, ba ghalánta agus ba ‘chostasaí’ dár tógadh riamh’. Trí réad iontach ar nós an chinn máis a thaisceadh i gCnóbha, ba mhó an mothúchán gurbh ionann na tuamaí agus ‘modh tomhaltais fheiceálaigh a bhí ceaptha chun gradam grúpaí iomaíocha a chur in iúl agus a fheabhsú’. 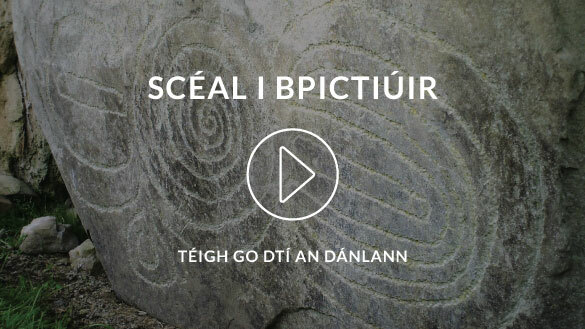 Dearbhaíodh an gradam sin sna tuamaí ar thrí bhealach: seilbh ar réada iontacha den chineál seo; úsáid eolais astralaíochta chun nasc leis an domhan neamhaí a léiriú; agus imeacht na séasúr, rud a dtugann Sheridan beolíne chuig na déithe air (cloch ar déanamh fallais, a bhfuarthas ceann díobh i gCnóbha freisin agus a thugann le fios go raibh gnásanna torthúlachta ann mar chuid den mistic seo); agus léiriú ar naisc idirnáisiúnta. Maidir leis na tuamaí beaga, amhail an ceann san Eanach, bhí siad ann chun ómós a thabhairt do laochra áitiúla ach bhí gné thar a bheith Eorpach ag baint leis na mórthuamaí. Tá cosúlachtaí móra ann idir tuamaí meigiliteacha na hÉireann agus tuamaí pasáiste ar leathinis na hIbéire agus in iarthuaisceart na Fraince. Ní dóigh gur tháinig na tógálaithe as na háiteanna sin; ach is dóigh go raibh siad ina gcuid de líonra nasc Atlantach. Bhí mothúchán féiniúlachta áitiúla ann cheana féin in Éirinn ach, ina theannta sin, theastaigh ó dhaoine go mbeadh eolas ar an tír mar chuid den domhan mór.